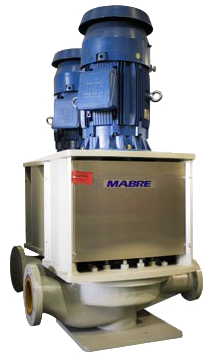 The Mabre line of ANSI vertical-inline pumps is manufactured to a design standard well beyond that of a typical B73.2 ANSI pump, in a hydraulic range exceeding all other ANSI manufacturers. Mabre Pumps are ideal for demanding oil and gas applications where API 610 compliance is not required. National provides vertical turbine pumps to the world market. NPC vertically suspended pumps have gained recognition in the market for their cost effective designs and quick shipments.